Today I have a Christmas Card to share that I made to send to my fellow Creative Guides at A Vintage Journey. We are a Tim Holtz inspired group so I wanted to use his products and techniques on my card. For the background, I used the Stripes stencil with Ranger Distress Iced Spruce Ink on a panel of Kraft cardstock. Then I stamped the sentiment and sleigh from The Mini Holidays 5 set using Archival Jet Black Ink. 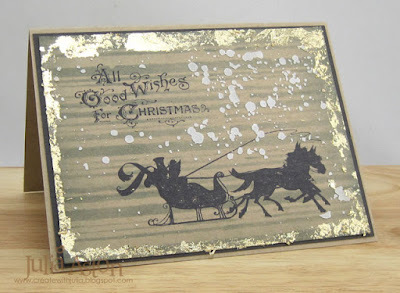 I made the 'snow' with the Speckles stencil (one of my prizes for being one of the winners for my Tim Holtz Sept tag!) with Wendy Vecchi White Embossing paste - I cut masks to cover the stampings when I stenciled the snow. I'm happy to say that I have all of my Christmas cards done and in the mail! Time to start on my stash for next year! Inspiration Journal - Tis the Season/Anything goes. Accessories: Stripes and Speckles Stencils - Tim Holtz, Eclipse tape (for masking), glue stick. Gold Metal Leaf - Stuart Superior, Wendy Vecchi White Embossing Paste. Oooh, Julia, I love this! I don't have any Tim stamps, but I so love the Vintage Journey, I might just have to get some and play along! I feel very lucky to be the proud owner of one these stunning designed cards. Love love love.....many thanks again Julia. It truly is a beautiful card Julia and how clever to make them all up so quickly! 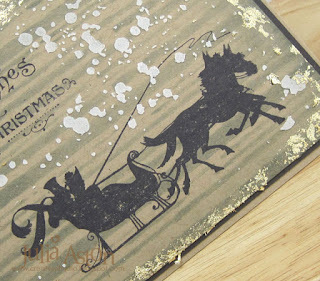 I love the stenciled stripes in the background and I love the sleigh scene too. You did make me smile about the metallic sheets - I found some and cannot even remember when I bought them, the are definitely messy but I love the end result! I am definitely going to start next year's cards in January....! Wow! Gold leaf - now that sounds like WORK! Lovely card, truly! Great background and the sparkle is awesome, thanks for playing our challenge at 4 Crafty Chicks. Such an elegant card and so vintage. 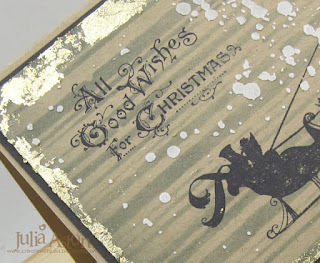 Love the stenciled background and the snowy touches. Thanks for joining us at Frilly and Funkie. Gorgeous card and I can't believe you were able to make so many in such a short amount of time! That is hands down amazeballs! Wowzers! That horse drawn sled stamp is now on my wish list! The gold is the icing on the gingerbread house! Stunning! So happy you were able to share such wonderful Happy Mail! Julia, this is such an elegant Christmas card, and I'm so impressed that you were able to create 16 cards in such a short period of time! Assembly line fashion or not! You are inspiring me to get started MUCH earlier with my cards this year! 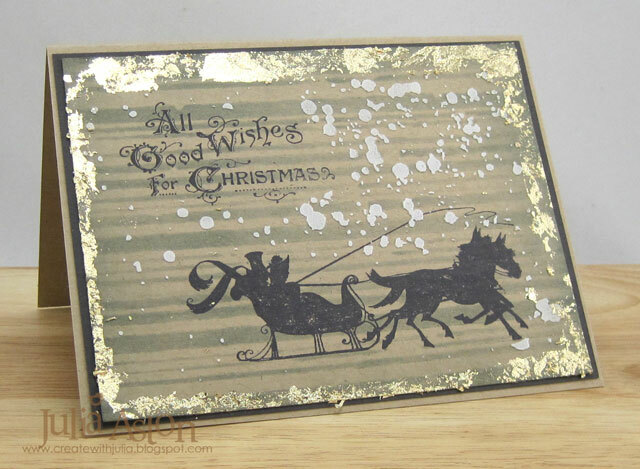 I love the use of your stripes stencil on the simple, yet elegant background and the speckles for snow--genius! I too, have the ions old foiling sheets that I was inspired to pull out by Tim's November tag, but mine seem to have passed their prime--not sticking to what I've wanted them to stick to! Messy, true, but so worth it in the end! Excellent techniques throughout this lovely card, and 16 lucky people are going to be very happy to receive their happy mail! Thank you so very kindly for joining our challenge at Anything But Cute! Love the wonderful vintage look you created...so festive. Happy New Year!